“Glenwood Stoves and Ranges! The Glenwood is indispensible to progress in cookery as well as comfort and convenience in modern housekeeping. The seller is Leslie L. Crosby, and we find his marriage record online: On September 19, 1889, he married Jessie R. Underwood in Putney, Vermont. Leslie was born in Waltham, Mass to Ariel Crosby and Marion Weston. His occupation at the time was Tinsmith, his age 25, so he was born about 1864. 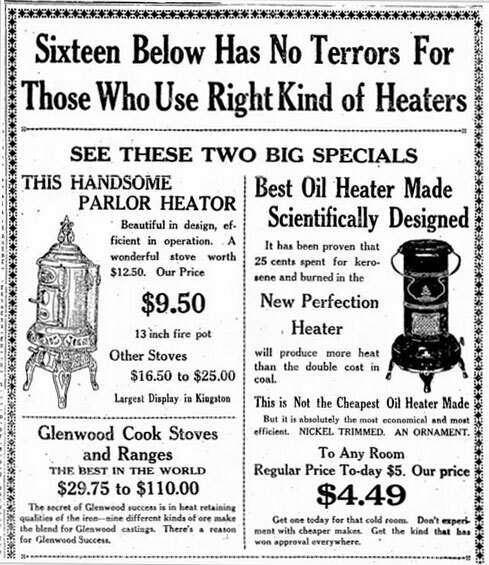 Glenwood stoves and ranges were made by the Weir Stove Company of Taunton, Mass. See the Good Time Stove Co. 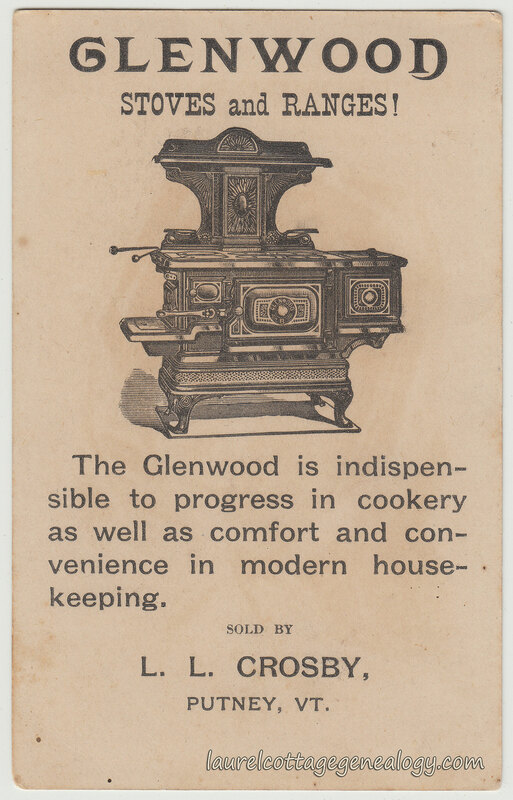 In newspaper advertisements “Glenwood Ranges” are starting to be mentioned around 1883 but “Glenwood Stoves and Ranges” not mentioned as such till around 1887. Here’s one of the latter that appeared in the Sacramento, California Union-Record July 8th. Jumping ahead about thirty years, a Kingston, New York ad that appeared February 13th 1917 in The Kingston Daily Freeman. With that caption you’d wonder if the temperature had dropped to negative 16 degrees that winter. Last but not least, for more on Wier see the Wikipedia article Old Weir Stove Building. 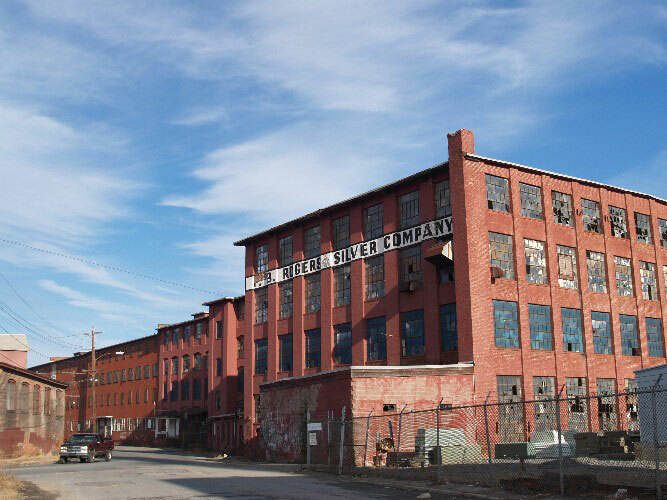 The old Weir building later housed the Rogers Silver Company. Photo (public domain) by Marcbela (Marc N. Belanger). This building is on the U. S. National Register of Historic Places. Trade Card for Glenwood Stoves and Ranges. 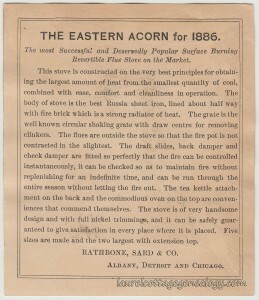 Sold by L. L. Crosby. 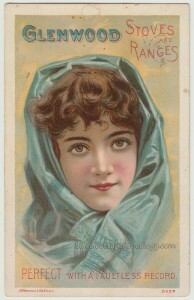 Circa 1890s. Lithographer: J. Ottmann Lithography Company, New York. 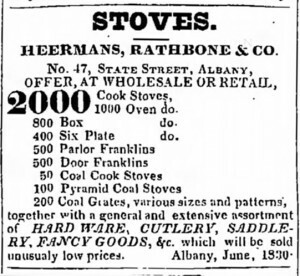 W. A. Greenough & Co.’s The Waltham and Watertown Directory, 1884. p. 54. (Ancestry.com. U.S. City Directories, 1822-1995). 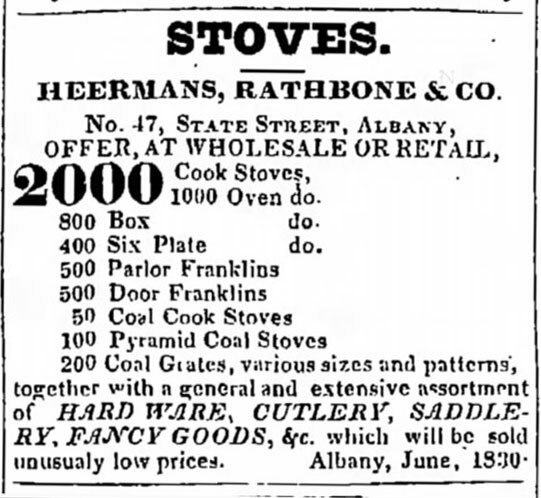 W. A. Greenough & Co.’s The Waltham and Watertown Directory, 1886. p. 73. (Ancestry.com. U.S. City Directories, 1822-1995). 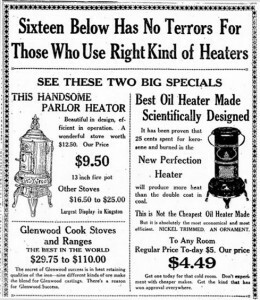 “Stoves For Sale – 063 Glenwood H 1893.” (sarahsantiquestoves.com) Web accessed February 28, 2016. Good Time Stove Co. (stoveprincess@goodtimesstove.com) Web accessed February 28, 2016. Old Weir Stove Building. n.d. https://en.wikipedia.org/wiki/Old_Weir_Stove_Building. (accessed February 28, 2016). A white veil or a goof-up? You’ll notice the “waves” in this trade card – it’s not laying completely flat, but still an exceptional card: showing an image of a Victorian Era auburn-haired beauty, in a sumptuous red gown trimmed with white lace and beads (or faux pearls?) wearing a long, large-beaded necklace, draped several times over, and with a cross pendant. (I keep thinking Madonna in the eighties). One of the best things is her headdress of oak leaves and acorns (love it!) She appears on a pale background of green leaves and acorns over red. But wait – what is the white part flowing from her left ear to shoulder? How funny – did the artist change his design and forget to fix it, or could it be meant to represent a veil flowing from the headdress? Hmmmm. 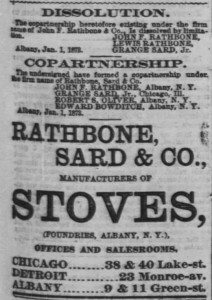 In February of 1873, an ad ran in the Chicago Daily Tribune (Newspapers.com) showing the dissolution of the co-partnership, John F. Rathbone & Co. to the formation of co-partnership Rathbone, Sard & Co. 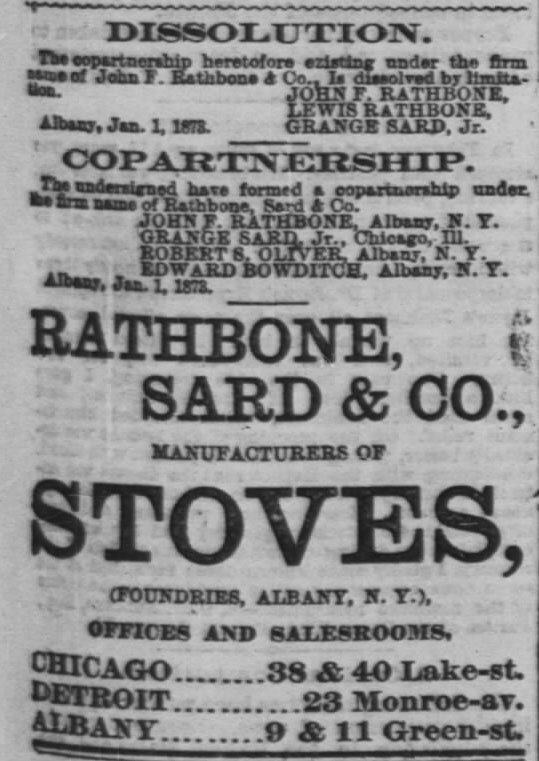 According to the ad, this change took place in Albany, January 1, 1873. 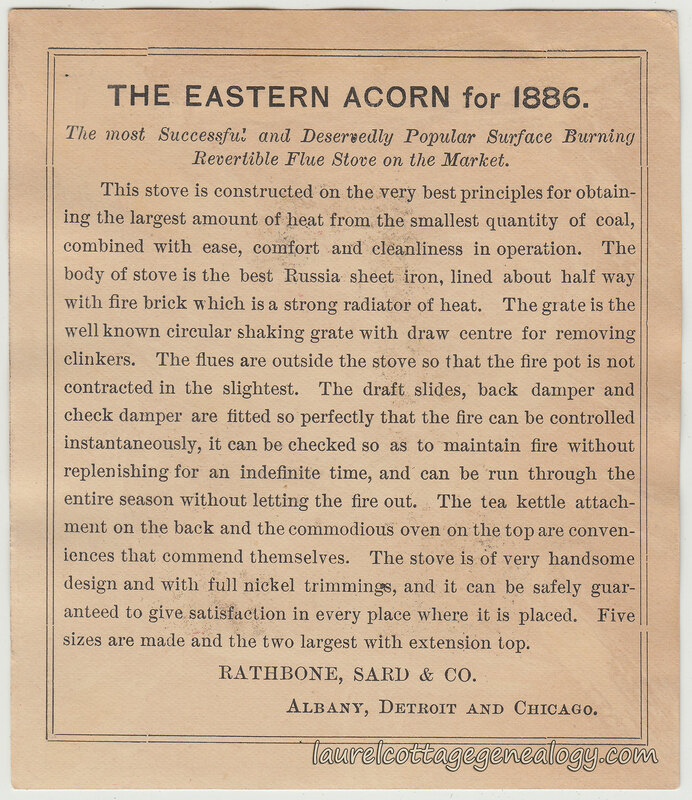 The brand Acorn was not found in any ads prior to (the officially-named in 1873) Rathbone, Sard & Co. And there are a number of different trade cards for the company currently found online; our particular beauty above, is extolling the virtues of “The Eastern Acorn for 1886” advertising it as, “The most Successful and Deservedly Popular Surface Burning Revertible Flue Stove on the Market.” Design-engineered for cleanliness, comfort, ease of use, and efficiency; the description includes details like the fact that the body of the stove was constructed from the best Russia sheet iron. 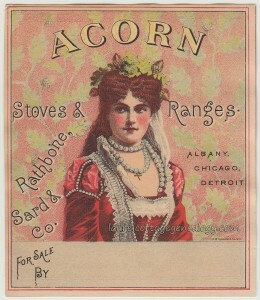 Trade Card for Rathbone, Sard & Co. and Acorn Stoves & Ranges. Circa 1886. Lithograph company: J. Ottmann, New York. Sources: Russia iron. n.d. https://en.wikipedia.org/wiki/Russia_iron (accessed November 22, 2015). “Joel Rathbone” and “Hudson-Mohawk genealogical and family memoirs.” Ancestry.com Public Family Trees. (accessed November 22, 2015). Andreas, Alfred T. History of Chicago, Vol. 3. pp. 483-484. Chicago: A.T. Andreas Co. 1886. (Google eBook). Torrance, Pat. History Cast in Iron at the Old Stove Works. Sept. 12, 2011. (Patch.com). Web accessed November 22, 2015.